An aerial view of the Pentagon building in Washington, June 15, 2005. WASHINGTON (Reuters) - Deputy Defense Secretary Ashton Carter on Tuesday said the U.S. military had launched a "long overdue" effort to safeguard U.S. national security satellites and develop ways to counter the space capabilities of potential adversaries. "We have established, really, for the first time, an integrated effort to bring together our space programs, all of them, with those folks who understand best the anti-satellite threat, and also how we can operate, if we have to, without spacecraft," Carter told reporters at the National Press Club. Carter said the initiative was looking at how to make U.S. military and intelligence satellite systems more resilient if they were threatened, or how to operate without them if need be. He said the fiscal 2014 budget included funding for the initiative, as well as "investments in our own capability to deny the use of space against our forces in a conflict." He did not provide additional details. U.S. defense officials often note that U.S. satellites underpin nearly all military functions today since they provide critical communications, targeting and weather data, as well as warning of possible enemy missile launches. 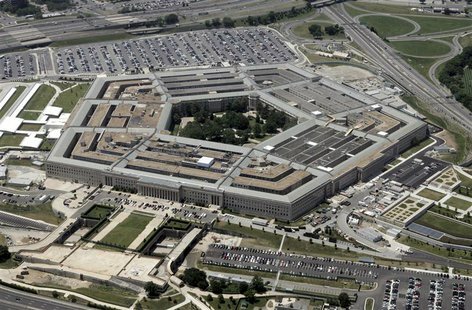 The Pentagon on Monday released an 83-page report on Chinese military developments, saying China uses computer espionage to acquire technology to fuel its military modernization, but China dismissed the report as groundless. The annual report also highlighted China's increasing space capabilities, citing Beijing's "multi-dimensional program to improve its capabilities to limit or prevent the use of space-based assets by adversaries during times of crisis or conflict." It said China was pursuing a variety of air, sea, undersea, space and counter-space capabilities, and military strategists there viewed the ability to utilize space and deny adversaries access to space as key priorities. The report cited a Chinese military analysis which highlighted the importance of "destroying or capturing satellites and other sensors" during a military conflict. The United States remains concerned about China's development of anti-satellite capabilities after it shot a missile at one of its own defunct satellites on orbit in 2007, creating an enormous amount of debris in space. Washington is keeping a watchful eye on China's activities in space after an intelligence report last year raised concerns about China's expanding ability to disrupt the most sensitive U.S. military and intelligence satellites. Sources familiar with the report said it contained credible information about China's ability to potentially damage U.S. satellites in higher orbits using its own satellites, missiles or ground-based jamming techniques. It has already conducted several anti-satellite tests in lower orbits.